The Coffee Spot Guide to South East London includes everything with a postcode starting with SE. 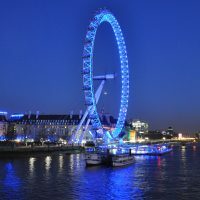 Just like East London, this is a massive area, encompassing everything sorth of the Thames, from Waterloo Station to Plumstead in the east, and stretching as far south as Crystal Palace. As with all the outer parts of London, it’s area I’ve not extensively travelled, so I confess that my coverage is not as good as I’d like. Most of the Coffee Spots that I’ve visited are clustered around Waterloo and London Bridge stations. As such, and as with all these guides, it should not be take as, nor does it claim to be, comprehensive. While you’re here, why not check out the rest of the Coffee Guides to London? Header image: the curve of the new stand at The Oval cricket ground. As regular readers may have worked out, my contract didn’t get extended at the start of June, so consequently I haven’t been heading up to Paddington every Wednesday. This in turn means that I’ve been missing my weekly trips to Beany Green. I’m therefore very grateful to the good folks at Beany Green HQ (aka Daisy Green) who have opened a new branch on the South Bank just for me! Since it’s just a few minutes’ walk from Waterloo, I can now get my Beany Green/The Roasting Party fix whenever I come into London. How cool is that? Tucked in beside the east stairway of the Hungerford Bridge and almost on top of the Look Mum No Hands Pop-up, Bean Green’s container looks like another pop-up operation, but don’t be fooled. I’ve been told that the new branch has a multi-year lease and will be here come rain or shine, fair weather or foul (ie a typical week of a British summer!). If you’re familiar with Beany Green in Paddington, then this is like a miniature version, with all the same elements that make my ex-regular haunt such a wonderful place, including the mad (in a good way) staff. Despite the explosion of great places around the country, good Coffee Spots at railway stations are something of a rarity, so while on my way to visit (the now defunct) Bambino Coffee in Crystal Palace, I was delighted to chance upon Brown & Green. It’s a lovely little place, tucked into the corner of the equally lovely ticket hall, built back in the days when railway stations were architectural statements in themselves. 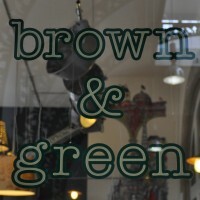 Brown & Green plays a couple of important roles. First of all, it’s a place to grab coffee on your way to catch the train. 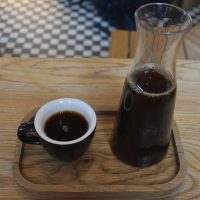 While the coffee won’t have third-wave purists purring with delight, it’s a distinct notch up from the average station fare. Secondly, it’s a (self-styled) coffee-and-brunch neighbourhood café which just happens to be located in a railway station. It’s in this capacity that I visited Brown & Green. The brunch menu isn’t extensive, but it’s pretty decent and I was impressed. A word of warning though: just be aware that if you are coming for lunch/brunch, the kitchen closes at 14.30 (a perfectly respectable time if you ask me) after which there is only a limited food menu available. Not that long ago, London’s Waterloo Station was a bit of a desert for good coffee. There was the Scooter Café on Lower Marsh, plus Bean About Town’s van on the South Bank, but that was about it. However, three short years later, things have changed. Bean About Town’s been joined by Beany Green and, in the summer, the Look Mum No Hands! Pop-up. Meanwhile, on Lower Marsh, first Four Corners popped up across from the Scooter Café and now, a few doors down, there’s Coleman Coffee Roasters. Run by Jack Coleman, who’s been roasting since 2010, the coffee shop appeared two months ago. Occupying what was, for a long time, a book shop, it’s not a huge spot, but what it lacks in size, it more than makes up for in character. Oh, and it has a wonderfully-secluded garden at the back. Coleman Coffee Roasters blends elements of old-school style with a third-wave lightness of touch. There are two single-origins through the V60 and a single espresso blend. In an interesting twist, this can be pulled one of two ways, either as an espresso or an “old-fashioned” espresso. Jack also dishes up Oaties (think savoury pancakes) with various fillings. CRAFT London is a new project by chef Stevie Parle and designer Tom Dixon. As the name suggests, it’s focused on the craft of making things. Located on the Greenwich Peninsular, a stone’s throw from both the O2 and North Greenwich tube station, it will ultimately be a café, restaurant and bar. 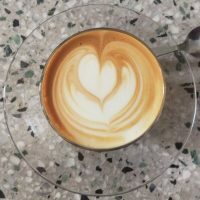 I visited it on Friday, five days after the café, occupying the ground floor, had opened, having been alerted to it by Robbie Calvert, who is café manager, head barista and (ultimately) roaster, all rolled into one. I had previously run into Robbie at Edinburgh’s Artisan Roast, where he’d impressed me with his passion (and his coffee). I’d heard that he’d come down to London, so I was keen to find out what he was up to. As luck would have it, I was already going to the O2 that evening for a Caro Emerald concert, so snuck in just before closing time to catch up with Robbie and his new venture. I have to say that I was impressed. Although CRAFT London had only been open for five days, it seemed to me to be a pretty decent operation with lots of exciting things in the pipeline! Having finally paid a visit to Flat Cap Victoria in last week’s Saturday Short, I thought it was high-time that the Coffee Spot got around to the other Flat Cap, which is tucked away south of the river in London’s Borough Market. Once part of a small fleet of Notes Barrows, Flat Cap Borough is now a standalone operation and, despite the similarities, Flat Cap Borough is independent of Flat Cap Victoria. There are, however, still close ties to Notes, with all the coffee coming from the Notes Roastery. There are a range of single-origin beans that you can buy, with one of them in the hopper. 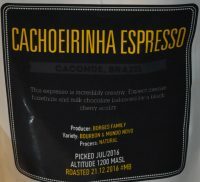 During my visit, this was a Brazilian Cachoeirinha, a naturally-processed coffee. All the usual espresso-based drinks are there, but otherwise that’s it. If you’re after something to eat with your coffee, never fear. You’re in Borough Market and spoilt for choice! A long time ago (at least, it feels that way) when I regularly visited London, I’d often wander past the Southbank Centre Food Market. Conveniently on the route from Waterloo Station to Hungerford Bridge (as I stubbornly still call the Golden Jubilee Bridges) it was made even better by the presence, at the foot of the stairs, of the Bean About Town coffee van, a lovely, old Citroen, run by the equally lovely, but not so old, Claire (who shares, by the way, her nationality with the van, both being French). It was one of the first places I wrote about on the Coffee Spot. However, things change, I ceased to be such a regular visitor, and I didn’t notice when the van disappeared from the bottom of the stairs. Then, last Sunday, with an hour to spare, I decided to wander out of Waterloo and have a nose around the market, whereupon I stumbled upon a big sign saying “Coffee” at the far end of the market. That’s new, I thought to myself. Only it wasn’t. It was the old Citroen van, with Claire still there, pulling shots. “What’s going on?” you might well ask. What’s going on indeed! London’s Lower Marsh is not the most appealing part of the capital. Even the name doesn’t conjure up particularly positive images. Lying behind Waterloo and not particularly on the way to anywhere, I’ve only recently become aware of it, despite Waterloo being my gateway to London for the past 15+ years. However, there it is and, in recent years, it has started to shed its poor image, becoming home to the likes of the Scooter Cafe [coming soon to the Coffee Spot, although I've been saying that for a year now!] and now, just across the road, to Four Corners Cafe. Four Corners is, if you’ll excuse the pun, going places. Taking inspiration from the phrase “four corners of the world”, it’s a travel-themed Cafe, decorated with maps of the world and dotted with globes. Continuing the travel theme, its neat loyalty card is in the form of a miniature passport. Not that this counts for much if the coffee is poor, but thankfully it’s not. As well as a decent coffee menu, powered by London Roasters, Ozone, Four Corners offers loose-leaf tea from Yumchaa and a small range of toasted sandwiches and pastries to die for (according to fellow coffee-blogger, Kate, aka A Southern Belle in London) from a bakers just around the corner. BREAKING NEWS (April 2014): Four Corners won "Best Use of Social Media" the inaugural London Coffee Stops Awards! 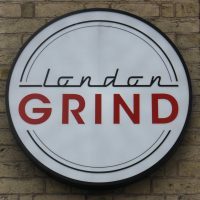 London Grind, at the southern end of London Bridge, was the first of London’s growing Grind chain to offer full restaurant service in addition to its tried and tested espresso bar by day/cocktail bar by night model. It’s also undergone a recent expansion which has added a large seating area at the back and more than trebled the size of the kitchen. There are several seating options, largely depending on why you are at Grind. If you’re dining, then there’s the aforementioned seating area, while if you are here for the espresso bar (day) or cocktail bar (evening) then you can sit at the counter. As a half-way house, a range of tables with padded benches lines the front wall where you can sit sipping your coffee/cocktails or having a more informal dining experience. As well as breakfast, lunch and dinner menus, there are also cakes and, at lunch-time, sandwiches. This was the first time I’d visited a Grind since the chain started roasting its own coffee in its new Shoreditch HQ. 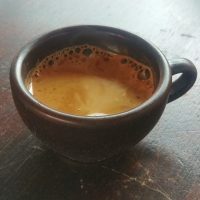 In keeping with the tried and trusted Grind model, there is both a house-blend (for milk-based drinks) and single-origin (espresso, Americano, etc) on espresso, as well as decaf. 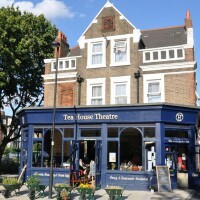 The Tea House Theatre is, as the name suggests, an old theatre (actually, it’s not, it’s an old pub) which serves tea (actually, it does; one out of two’s not bad). It’s somewhere I’ve been going, on-and-off, for the last year, and have always meant to write up for the Coffee Spot. I’ve just never had the excuse. Until now, that is. During a recent visit by the esteemed Bristol Café Watcher to the fair city of London, I remembered one of Café Watcher’s rare faults: a penchant for drinking tea. I therefore decided upon the Tea House Theatre as the final destination of a day spent wandering around London in the sunshine. When it comes to tea, it doesn’t get better than this, with numerous (I ran out of fingers and toes while counting) loose-leaf tea offerings. However, probably the most relevant thing about the Tea House Theatre, given that this is the Coffee Spot, is that it DOESN’T SERVE COFFEE! That’s right: after dallying with the “other stuff” in Cardiff, I’ve finally gone the whole hog and written about a place that only does tea. And superb cake. And food. But not coffee. It’s lovely by the way. September 2015: I’m delighted that the Tea House Theatre was short-listed for this year’s Lunch Business Awards Best Tea Experience. 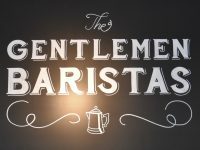 The Gentlemen Baristas, which started life at the end of 2014 on Union Street, just south of the Thames, now boasts four branches, of which this, on nearby Park Street, can legitimately be said to be the baby. In terms of look and feel, however, it very much has the air of a miniature version of the original, albeit with a cut-down coffee menu featuring two options on espresso and another on batch-brew, pour-over having been sacrificed to save space. This lack of space also means that seating is at a premium, with room for four inside and another four outside on two benches. That said, there’s still the space for a well-stocked set of retail shelves, selling retail bags of coffee/coffee kit on one side, and produce at the other, including pickles, preserves and condiments. Meanwhile if you’re hungry, there’s a range of cakes and sandwiches. 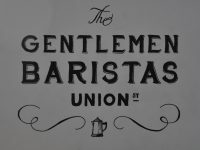 Another victim of the lack of space is cups, The Gentlemen Baristas only offering takeaway cups, so bring your own, although there are some espresso cups knocking around. The Watch House, on London’s Bermondsey Street, south of the river, is one of those “new” coffee shops (like Lundenwic and The Black Penny) which I’m embarrassed to say has been open for several years. In the case of The Watch House, it will be four this September (and has also opened two further branches!). In my defence, while I come into London via Waterloo, I rarely spend any time south of the river, which, if it has more gems like this, is entirely my loss. The Watch House is housed in a small, octagonal building dating from the 19th century, which was built to house the watchmen looking after the neighbouring church (hence the name, The Watch House). It’s a gorgeous physical space, if, like me, you like old buildings, reminding me a little of York’s Perky Peacock, another coffee shop housed in an old tower. The coffee is as gorgeous as the surroundings, with the Empire blend from Ozone on espresso, where it’s joined by three single-origins on batch-brew, which change on a weekly basis. If you’re hungry, there’s breakfast, lunch and plenty of cake, with bread from two local bakeries, The Watch House supporting various local suppliers. Once upon a time, good coffee was relatively hard to find near Waterloo Station, but now it’s positively ringed by great options, from Four Corners and Coleman Coffee Roasters on Lower Marsh to For the Good of the People Coffee and Beany Green on the South Bank. However, the latest addition, Urban Baristas, on Waterloo Road itself, has the distinction of being the closest to the station, just across the road from the main Jubilee Line concourse. 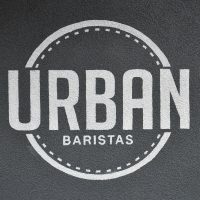 Urban Baristas is a small chain which, starting in 2016, now has four locations, the Waterloo branch opening in October last year. It’s a tiny place, reminiscent of Goodge St Espresso, only smaller. Despite the size, there’s espresso from Union Hand-roasted and a rotating cast of guest roasters on batch-brew, plus cake, sandwiches and toast if you’re hungry. There’s also a selection of tea and Kokoa Collection hot chocolate. Naturally it’s takeaway cups only, so don’t forget to bring your own, while Urban Baristas has gone cashless at Waterloo, so you’ll also need a credit or debit card. If you don’t like lists or just want to see where everything is, you can use the map to find your way around. Note that this shows the closest 50 Coffee Spots to the centre of the SE postcode region, not just those Coffee Spots in the SE region.